This blue floral dress that I bought last year from Lulu's is still a gem in my closet. 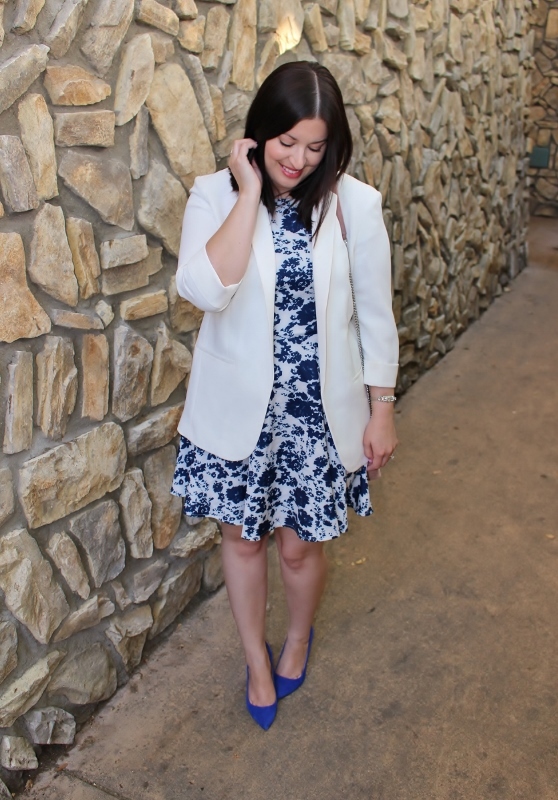 It's incredibly flattering with its fit and flare style, and you know I love the combination of cobalt and white. 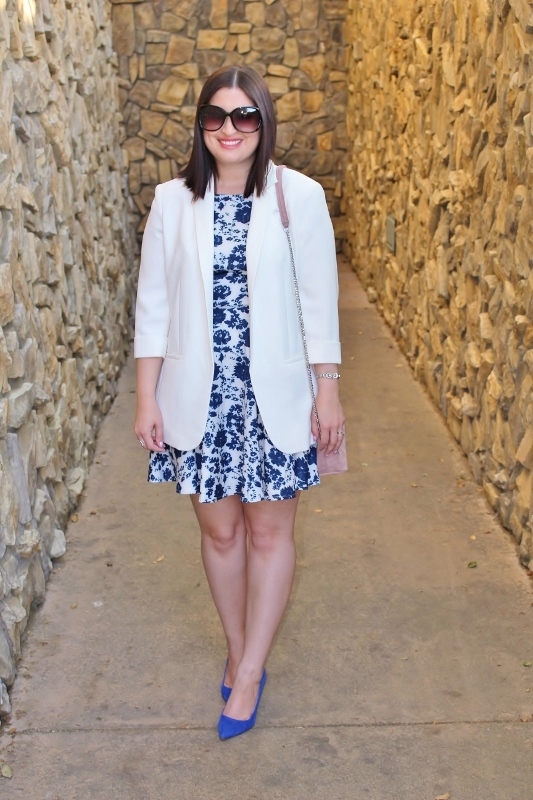 I wore this on Saturday for a day filled with pinot noir and music at the winery we belong to, a quick pop in to Ulta, and of course blog photos at Temecula Creek Inn. Do you ladies like this location? I realize all of my outfit photos are redundant because of the same backdrop, but we find that the lighting is the most even and it's protected from the wind. But let me be completely honest - I love photos here because they are typically flattering. We have tried other areas around town but usually end up defeated due to high winds, patchy light, and too many people. My gel pink nails with glitter at the tips, slightly faded out. This YSL lipstick in Le Orange that I've blogged about before. In fact, that post has been my most popular and I have no idea why! How are you doing this week? Good I hope. Linking up with On the Daily Express and Straight A Style today. Also linking up with I do deClaire and Pumps & Push ups. This is such a pretty outfit and I love that little blush bag. You look so pretty! Love all of this - dress, pumps, bag, blazer! And how interesting that your lipstick post is one of your most popular! It's so surprising sometimes what clicks with people the most! I love this dress! Cobalt and white is always one of my favorite combinations. The white blazer is a great touch. I am always jealous of your winery trips, ha. I like this location. I totally know what you mean about finding one you like and sticking to it. We have about 4 we rotate between because they work best lighting and people wise. I adore this dress and love how you polished it off with the blazer! 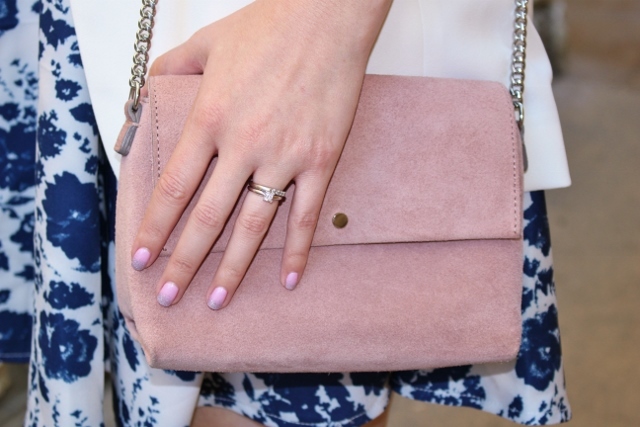 Dying over that pink suede bag! When you find a good photo location like that you just keep going there! I wish we could have a place like that in our yard (because that is the only place we can take photos)! I noticed your nails right away, what a gorgeous mani! And that dress is incredibly flattering on you! This is such a pretty outfit! 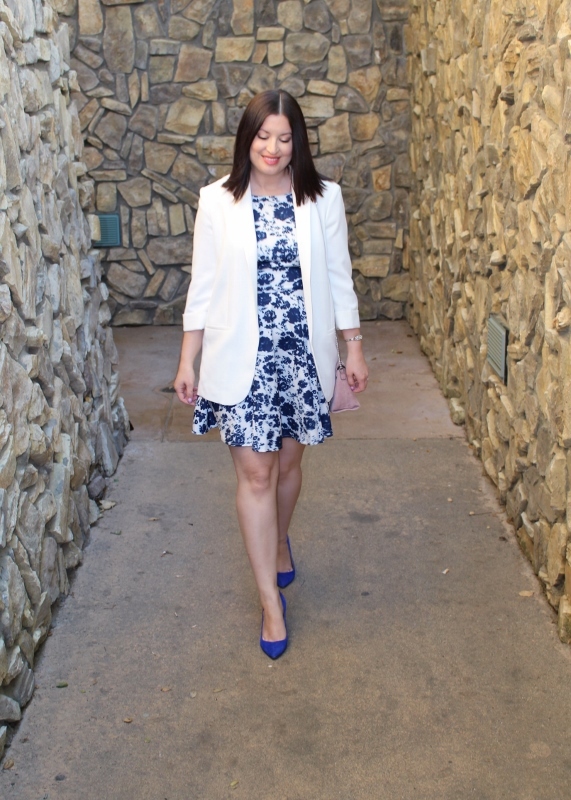 Love the white blazer and cobalt shoes with the dress. When you find a place that works you go with it! I have a favorite spot too! Love your dress!